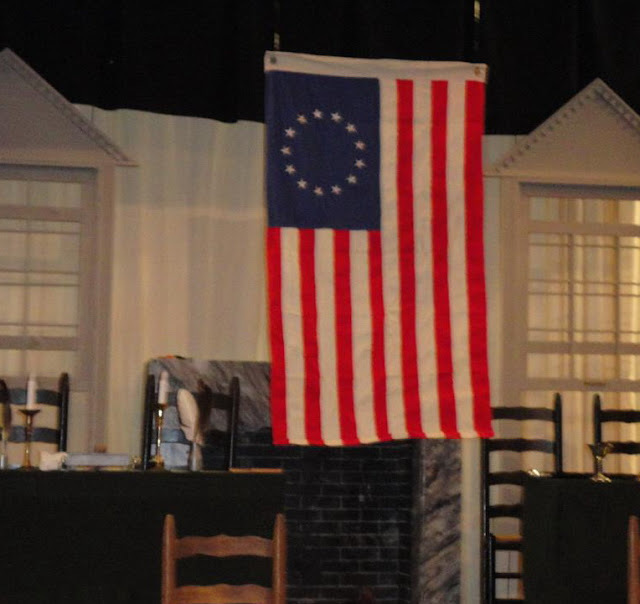 Putnam County Playhouse: IT'S "1776"!!! 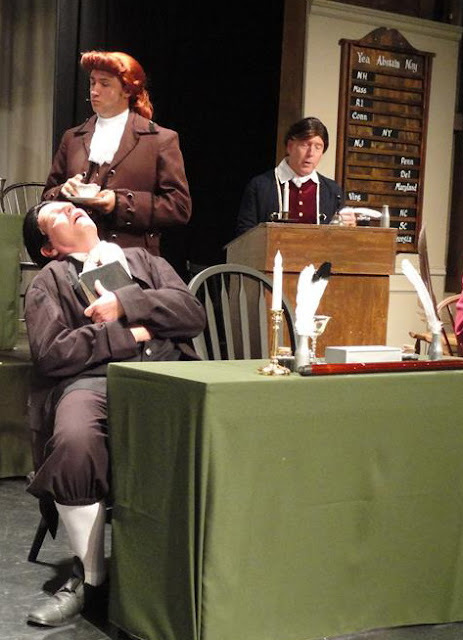 1776 ended its run on August 20! First National Bank is corporate sponsor for the production. Director is Shelly McFadden. 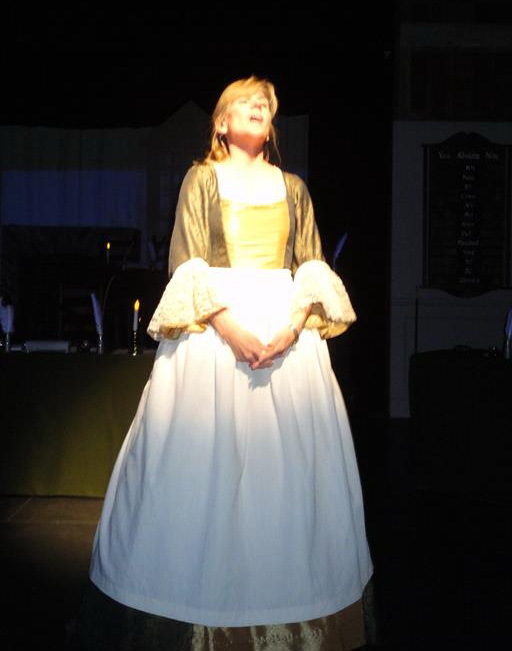 Vocal direction is by Kathryn Dory. Pit conductor and pianist is Marilyn Burdsall Rush. Also in the pit are Dedee Schwomeyer, percussion; Marcia Boswell, woodwinds; and Morgan Asher, keyboard. Linda Gjesvold designed the set and choreography is by Deb Grammel. Assistant director is Katie Wallace. Costumer and wig designer is Diana Van Middlesworth. 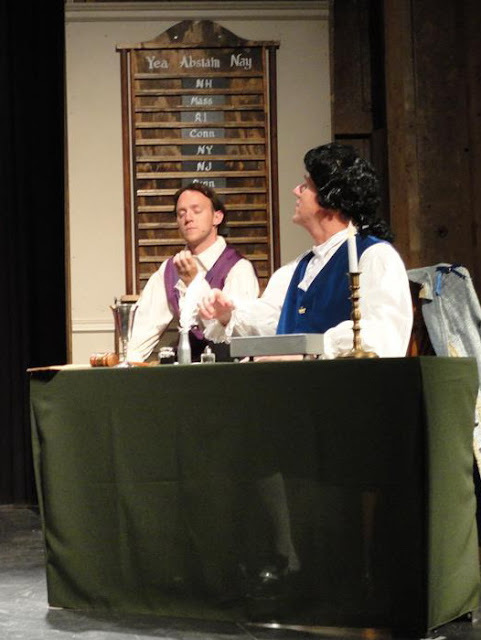 The cast is led by Joe Buser as John Adams, Ric McFadden as Ben Franklin, and Lee Reberger as Thomas Jefferson. Buser is making his PCPH debut. McFadden has played leading roles in The Music Man, Man of La Mancha, and Camelot. 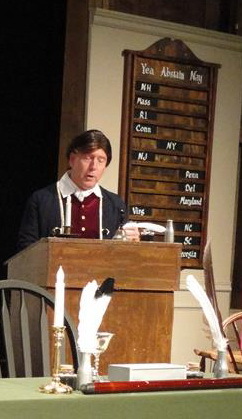 He most recently appeared in Damn Yankees at Myers Dinner Theatre. Reberger appeared in The Drowsy Chaperone and directed last season's Into The Woods. 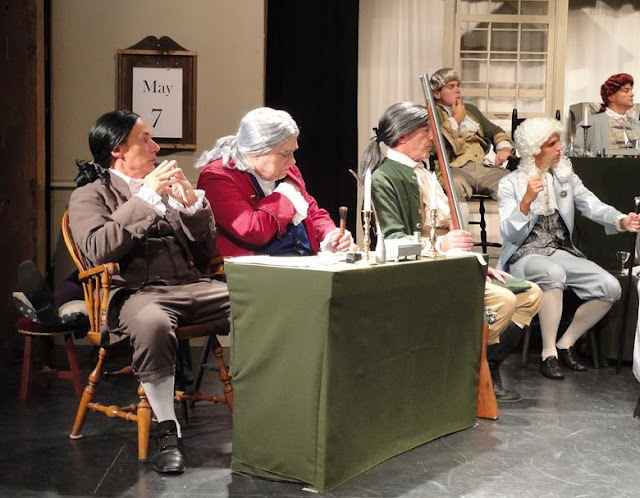 They are joined by Josh Bain as conservative John Dickenson, Chris Wurster as Col. Thomas McKean, and Michael McClaine as President of the Continental Congress, John Hancock. Front - L-R: Joe Buser, Joshua Bain Back - L-R: Don Wilson, Dustin Bond, Bill Cole, Jacob Gldden, Jack Randall Earles, Alex Asbell. 1776 relates the story of the writing and signing of the Declaration of Independence. The founding fathers are seen as real men and not the one-dimensional characters usually found in history books. 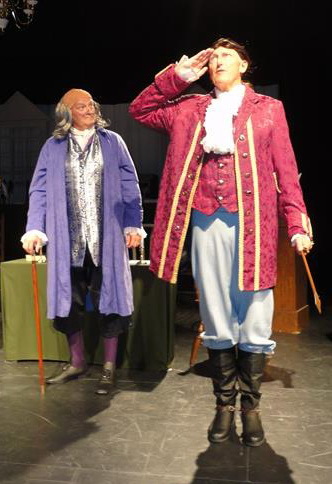 The distaff side is represented by Caroline Good as Abigail Adams and Sarah Bond as Martha Jefferson. 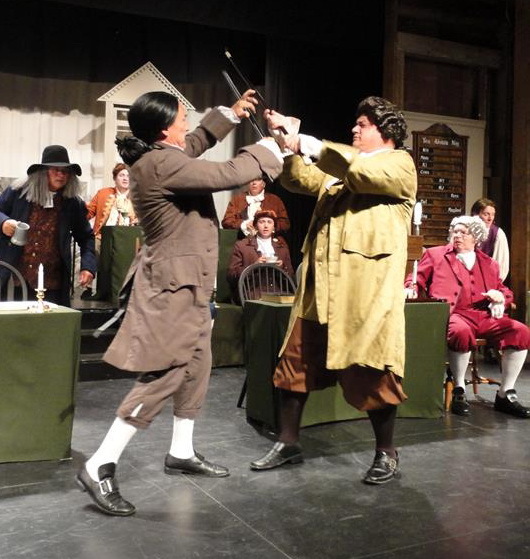 The large cast also includes Gary Van Middlesworth as Richard Henry Lee, Dustin Bond as Edward Rutledge, Don Wilson as Stephen Hopkins. L-R: Andrew Ranck (Rev. Witherspoon is bored), Jacob Glidden, Scott Armitage. Other members of the Congress are played by Matt Schneider, Clarence Long, Jacob Riggen, Andrew Ranck, Michael Nowling, Jim Rambo, Lance Clodfelter, Jacob Glidden, Brian Howard, Bill Cole, and Jack Randall Earles. Appearing in supporting roles are Scott Armitage, Joe Lippard, Alex Asbell, and Donovan Asbell. Also working on the technical side are Jessica Masner, stage manager; Samantha Flannelly, sound board operator; Melissa Green, light board operator; and Cameron Wunderlich and Sarah Nowling as spotlight operators. The musical originally opened on Broadway and was nominated for five Tony Awards. 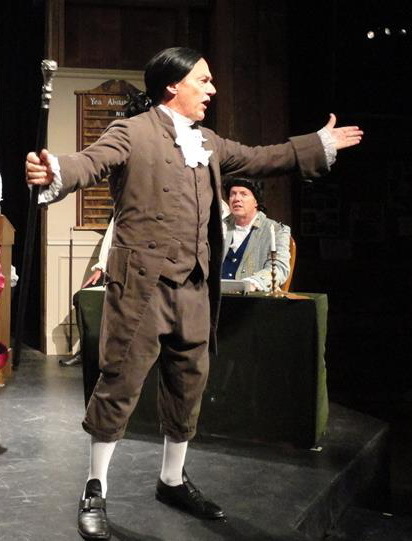 It won three including Best Musical, Best Direction of a Musical, and Best Featured Actor (Ron Holgate, who played Richard Henry Lee). Music and lyrics are by Sherman Edwards and the book is by Peter Stone.